Swashbuckling pirates, Sir Francis Drake, Horatio Nelson, my dad and grandfather all shared a love for and experience of the sea – and late last year I found myself living the dream. My fascination with sailing was, until that time, limited to books and my dreams. On holiday as a kid I would play for hours at the water’s edge with sticks pretending they were ocean-going sailing ships in imaginary battles with pirates. I became so fascinated and read so much that on my first trip to see Nelson’s Flagship, HMS Victory, I not only helped but took over the young guide’s role as he became stuck on questions about the carpenters hole, and the difficulties of firing guns at close quarters. Unfortunately, I had never done any actual sailing. 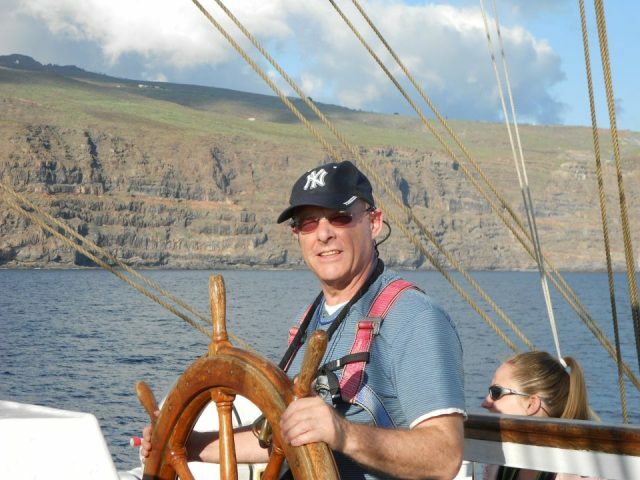 For my 60th birthday I was given the opportunity to book a sailing ship cruise. 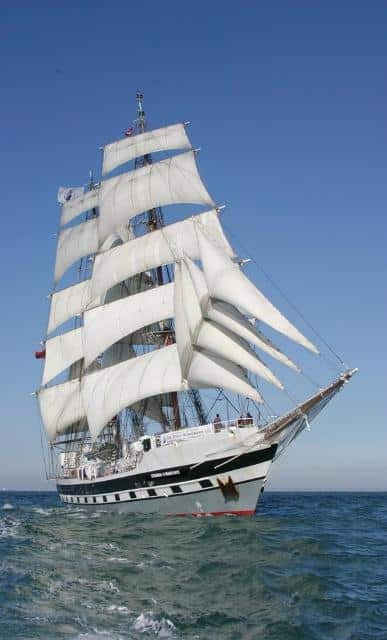 As always, other pressures deferred this and it was two-and-a-half years later when my lovely wife booked me a cruise around the Canary Islands on a large square-rigged sailing ship. Living the dream of climbing the masts and yardarms, with the ship rolling and pitching, went from a dream to terrifying possibility. 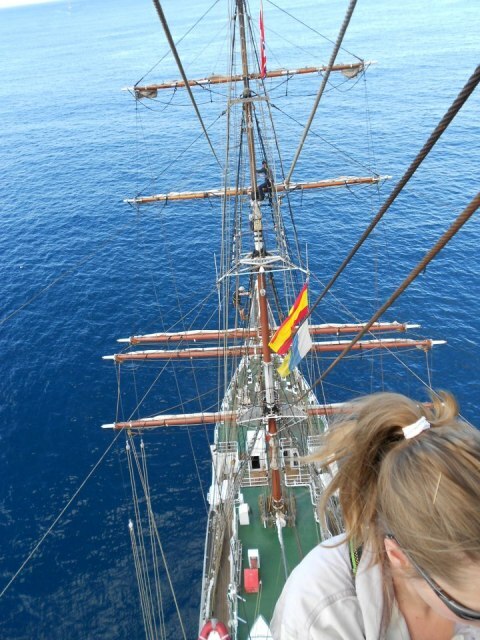 The Stavros S Niarchos is a youth training ship that also runs paying adult expeditions to help fund the youth trips. I met the ship in Santa Cruz, Tenerife. 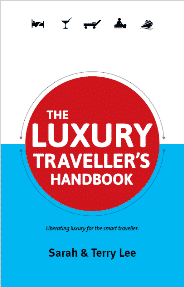 Any ideas of a luxury cruise were soon dashed, as I was pointed to my cramped eight berth cabin. My bunk looked like a stretcher – two poles with some canvas drooping between them. The toilets, or heads in nautical terms, were limited to two which served the normal crew of some 48. Right from the start there was no relaxation – physical or mental. My very first role was to take the helm and manoeuvre the ship out of the harbour – arghhh! Under the watchful eye of the strict Irish captain, I struggled to understand how the ship reacted to the helm. I had to wait about 40 seconds before any changes I made on the helm, actually had any effect on the ship. Over or under steering in the confines of the harbour, full of luxury cruise ships, could prove embarrassing. But I need not have worried, as the captain watched my every move, shouting the occasional “Port 10” or “Starboard 20”, which I had to repeat before making the adjustment to ensure I heard correctly, then calling “Port 10 on” when the manoeuvre was completed. When we finally entered the open sea the captain called “Steer One One Zero” and we were off to Gran Canaria. My relief in reaching the open sea was palpable, but they still felt confident enough in my efforts to leave me alone to steer the required course. I enjoyed the next hour and many others after, controlling the ship against wind and tide. 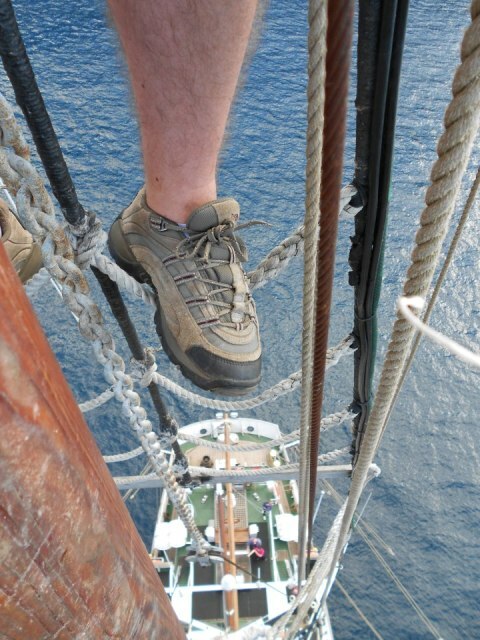 Nine miles of rope make up the rigging of this two-masted ship. However, I need to say, the only rope on the ship is the one on the clapper of the ship’s bell. All the other “ropes” are called either sheets or halliards. The need to keep to the nautical terms was very important and remembering them was a real challenge. But whatever the ropes were called, they managed to take chunks of skin from my hands. 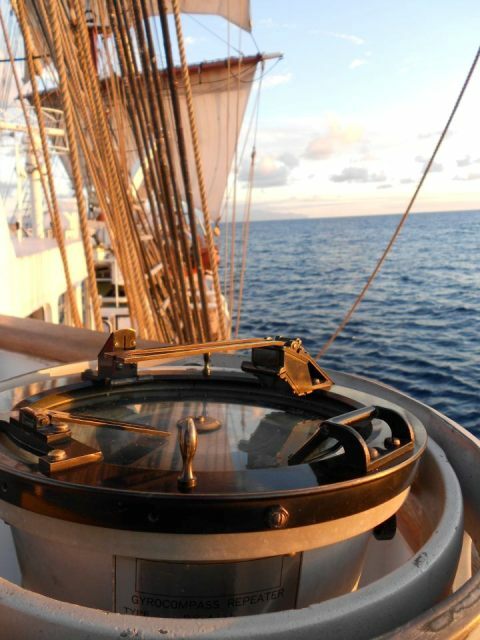 The Stavros S Niarchos’ masts and rigging are made to the specifications of a 19th century sailing ship. 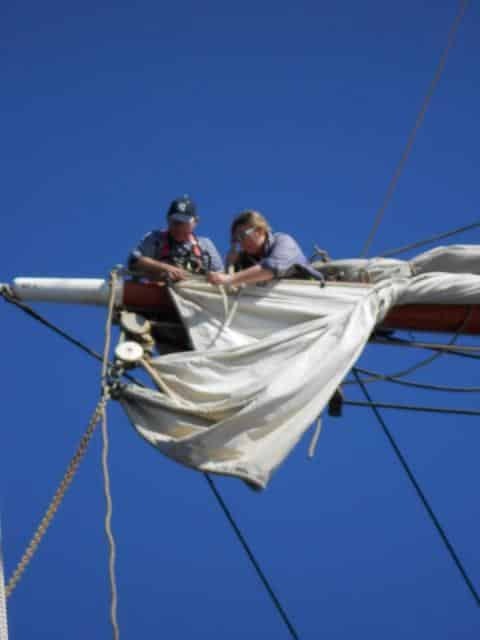 There are no motors or winches to help with the heavy work of handling the sails, all of this means manual heaving and hauling. As the ship slowly rolled from one side to another, I’d climb the rigging and shuffling along a small rope I’d hold onto the yardarm some 75ft over the sea. I was harnessed to the rigging but not all the time, this gave me reason to think about health and safety. The problem comes when you need both hands to haul the sail up onto the yard. My duty was normally at the end of the yardarm over the sea. I had to reach down some way to pull at a large block attached to a heavy chain, with my feet slowing going skyward, as my body sloped down the other side in the exertion of hauling all this weight up. A fall of course would be halted by my harness, but I did think about those brave souls who did this as a living, on high seas, without a safety line. Working aloft at night added a whole new dimension to the fear of heights. Below me I could not see the sea, but could hear the rush of the waves along the ship’s side. Falling into a sunlit sea was one thing, but falling into the inky blackness was a different consideration. The deck lights illuminated the guys working below. Tiny figures hauling the ropes and looking up to see how we were doing. Feeling brave (or wanting to seem so), we waved with both hands in the air, balancing on the little foot rope and the yardarm itself. Night duty also meant being on lookout. At sea, with no light pollution, the sky is amazing. So many stars, so many shooting stars it was breath-taking. It was difficult for me to take my eyes off the sky to focus on my job. After a while, staring into the darkness amid the silence of a calm sea it was easy to see why sailors are superstitious. The mind starts to play tricks as you hear noises, see shapes and imagine all sorts of creatures below the waves. At one point I was sure I could hear the splashing and squeaking of dolphins alongside, but I was not sure enough to claim it as a fact. Several times I mistook a star on the horizon for the light of a ship, but again as I was not sure enough, I did not bring it to the attention of the officer of the watch which would have been embarrassing. During one of my daytime watches, I had the greatest pleasure in seeing pilot whales and dolphins. This was incredible. We have all seen them on TV, but to watch them in the wild, swimming close to the ship was magical. Those who have seen the stars and wildlife at sea, will understand when I say I do not have the words to make others appreciate the emotional experience. At the end of the week I was called to the bridge. “Oh dear, what have I done?” I thought. Generally a call to the bridge is a ticking off. I was already pleading complete innocence and the fact I was not there when whatever happened, happened as I climbed onto the bridge. However, much to my surprise, I was congratulated for my efforts during the week and invited to become a volunteer for the Youth Trust. This means that I can join other trips and help train young people while learning more myself. How could I refuse? Now I really am living the dream.